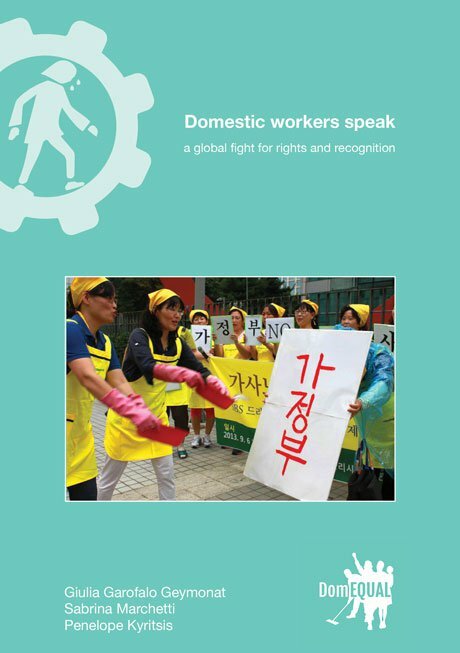 A collection of terms from the ILO Convention 189 accompanied with stories from domestic workers. Domestic workers at a demonstration. ILO/Flickr. Creative Commons. This was the first occasion in the Netherlands in which these workers became visible as a group. Two years earlier, the International Conference of Labour in Geneva adopted the ILO convention 189, an agreement which states that domestic workers have all the same labour rights as regular workers. The Dutch government also voted for the adoption of this treaty but differently than in the neighbouring countries, the Netherlands have yet to ratify the convention. To date, the majority of domestic workers in the Netherlands continue to live and work in the shadow zone of Dutch society. The work they do is mostly invisible working behind closed doors, for which they have the keys. They receive instructions from notes left on kitchen tables, where they also find their day's payment. Some of these workers prefer not to be seen if they don't have residence papers and must stay unnoticed. The domestic workers without papers, known as 'undocumented' workers, face situations which are unthinkable for other workers in the Netherlands. Everyday activities like using public transport, buying insurance or taking a holiday, present great challenges for them. 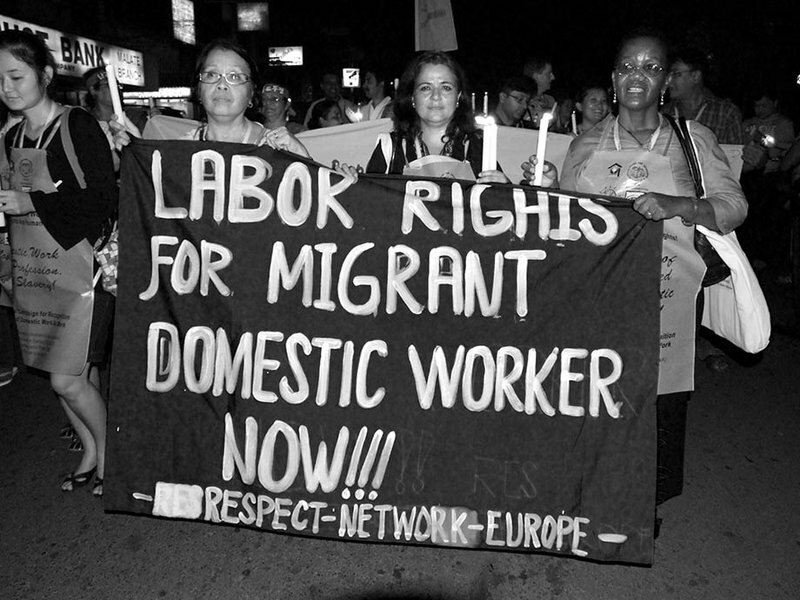 As a labour union, we at the Migrant Domestic Workers network FNV have no means of helping domestic workers obtain legal residential rights. We can however provide support and advice about work and income. The Dutch federation FNV isn't just for workers with papers, but for all workers, no matter their labour situation and legal status. For this reason, domestic workers have been able to join the FNV since 2006, the same year they began organising joint meetings at home and inviting union staff to discuss their specific needs. In those same meetings, they received their first membership cards, which for many constituted the first tangible proof of their existence in Dutch society, a milestone and starting point for self-organisation and the building of their collective strength. Who are these workers, who are mostly young women and whose presence in our society is structurally denied by the Dutch government? Where do they come from and how long have they lived among us? On 13 April 2017, the Federation of Netherlands Trade Unions FNV published and presented the booklet "Words of Labour" to the Social and Economic Council of the Netherlands as a collection of some essential terms from ILO convention 189. In the following pages, you will find a selection of these words accompanied by stories from domestic workers, stories that shed light on their invisible reality in the Netherlands. If you want a good service you have to pay me good too. This is the main thing I negotiate with my employer before I start to work for them. They always notice that my payment is higher than normal. This is because I treat the house as my own, I really look after it as if it were my own. So I always say that a good service costs something, and that you have to also treat me well. Because if you're mean to me, how can you have my loyalty? There is enough work. The neighbours of our employers constantly ask if we have free time left. There is a demand for domestic work. There is always someone in need of a cleaner and we always recommend our friends. So the contacts are made via via, through word of mouth, and this is connected with trust. Because if you trust me, you can also give this trust to my friend. Also when we have too much work to do or if you get sick, we always ask friends to help us. When you ask somebody to replace you, it has happened that the employer asks that person: do you want to stay working for us? A Filipino will not really accept this, because there's a kind of principle that tells us, “We are a community!” And if you nevertheless do that, you know you will be ostracised. In almost every family there's someone who works abroad. Actually one in five people from the Philippines live and work outside of the country. This all started in the time of Marcos when Filipinos were encouraged to go abroad. It became a policy of the government to export human capital. And then in Saudi Arabia there were Filipinos as construction workers, as in the Middle East there were Filipinos working as domestic workers. So the money and sacrifices of these people working abroad helped the economy of the country to grow. This policy was maintained until the end of Marcos' administration. And it also became part of the mentality of the Filipinos. Something like: 'I want to study so I can go abroad'. This became normal to everyone, especially among young people. Right now, according to the Filipino mentality, going abroad is the only solution to have a better life. It is common that after graduation the plan of a person is not to have a business or to work in the Philippines but to work abroad and send the money home. And the family spend this money so easily, because they think that money in Europe is something you just pick from the tree. So this mentality creates a vicious circle that is followed by everyone in the family. if someone comes to the gym while you are cleaning just say that you came to deliver something. Please, don’t ever tell to anyone that you are working in my gym and that you work as a domestic worker. This is the way one of my employers wants me to behave toward the outside. Because if other people know about me working there, she will get a fine. Right now, according to the Filipino mentality, going abroad is the only solution to have a better life. There's a risk of being caught when you don't pay for the bus or tram or if you have an accident with your bicycle. These are moments when the police comes automatically. In the office I saw all my colleagues laughing at me for this. It was ridiculous! You know what? When it happened, I thought: this is my last day here. I had a discussion once with a friend. After his daughter graduated from engineering school, my friend brought her here to be the same as us, to be a domestic worker. I told her: “Why did you send your kids to expensive schools, make them acquire a good degree and then bring them here to work as undocumented domestic workers? And who will be next? Your granddaughter? Your grandkids?” I mean, how can you end this cycle of working abroad if you don’t change your mentality? My friend thought I would do the same with my children. But I told her: “No! They are going to a good school in order not to be an undocumented worker abroad.” There is nothing wrong with being a domestic worker, but I want them to have a better chance, a better opportunity in life. If they really want to go abroad it is because they will work in the profession that they've been studying for. Otherwise the cycle never stops repeating. I am living a life that is very depressing in regard to work. The only difference is that it is now much easier for me to go back any time, to see my children and family. It's easier to walk on the street here without being afraid of the police. It is easier for me to have access to health insurance, to have a bank account, and so on. But there are lots of troubles in all this as well. When I was working without papers I didn’t have to think about taxes, for instance. I knew I was not really secure here but I didn’t have that stress of the taxes. Anyway, I think being documented is good for me, because it allows me to have the most basic rights in this country. And above all it makes it possible for me to move forward in life. Most of our employers tell us, that if we would have papers they would be glad to give us a regular job. But I don't get any holiday money. The only thing we get is a bonus for Christmas. And for my birthday I also received something. I would say it always depends on the individual agreement you make with every employer. But most of our employers tell us, that if we would have papers they would be glad to give us a regular job. There's one employer that always turns on a Filipino radio station when I come to work. He even asked me which radio station I want to listen to when I'm working, and I said: “Love Radio.” Sometimes when I arrive in his house and there is nobody there, the music is on. It is so surprising to hear this music when I open the door! He does it to make me feel comfortable. It's not advisable to have a lot of money here. Because once you get arrested there's no chance of going back to your room. If you're caught, you know any money you keep there is gone. Therefore most of us, as we don't have our own bank account here, we need to make money transfers to people in the Philippines that have a bank account. Sometimes these are your nieces or your own kids. Other times it is your husband or your wife. So this is what the majority of people do. But when there is a sick person in the family they will use the money to help this person. It is needed and you have no choice. In the Philippines they see you as a big bank account. In the Philippines they see you as a big bank account. And when you go back home, the savings are not under your name and you want to get it back. This is always a big issue! Usually there is already a lot of money accumulated over the years and this causes trouble. You even have to push to get your money back once you have returned to your country. It is your money but it is deposited on an account that is not yours. The solidarity in our group is strong. But talking about the relationship between documented and undocumented, that is very different. Yes, there is solidarity between the undocumented, I can assure you. But in the relationship between undocumented and documented migrants… there is a barrier, somehow. One of our colleagues was accidentally hit by a car when she was on her bike. The owner of the car called the police. So the police came and asked the lady for her passport and also checked her bag. The lady had 3000 euros in her bag and the police asked: “Where does all this money come from?” She told them that it was Paluwagan and she could not explain them what that is exactly, so the police took the money. Paluwagan is something that many of the Filipino workers use. To be able the save money, a group of people form a common fund. For example, every week ten people decide to put, let’s say a hundred euros in this fund. At the end of the month the total amount gathered is picked up by one person of the group. Then they rotate and do the same for someone else of this closed group. It is a kind of system for making savings. We are used to being connected with each other. We are not raised as individuals but as a collective of people, as part of a group. In Ghana there is a kind of story that if you take a broom and if you break it, it breaks. But when you are holding it together and try to break it, then it doesn’t break. So that is also our driving force, togetherness means victory. Of course we have problems but we're not depressed. It is the system here that makes people depressed, because it makes you dependent on it. If you have a problem with the government, it's between you and the government, and in that situation you don’t have anyone to fall back on. And that is depressing. In my country, if you have a problem, the system cannot help you, the system does not support you, so you have to fall back on your own family. You are dependent on them and they become your support system. That's why many domestic workers without family in the Netherlands get depressed. We live in fear, because everybody is busy, nobody wants to listen to you and no one wants to hear your story. You walk with a burden and you go on and don’t know what is going to happen next. The only thing that keeps us going is our perseverance. She treats me like a daughter. She advises me on things. She asks me: “What did you do this weekend?” And I say: “Oh, not much, I was studying.” Then she replies: “But you are young, you need to go out and have fun!” And recently her mother died and I thought her mother was my grandmother so I cried, I really felt pain. Another employer owns a restaurant and his wife is a lawyer. I call him Sir or boss because we don’t have that kind of close relationship. But one day I was really surprised when he sat me down at the table and started to talk about his problem. He told me what he went through during his childhood and it turned out I had to advise him. That was new to me, because I call him boss so it was a change in our relationship. He ended up giving me ten euros more, because apparently he liked what I told him. When you are undocumented you only have one option, to plan your life back home. When you're undocumented, you only plan your life back home. Therefore if you have money and you don't know what can happen to you here, better to not keep the money here. Actually, you plan your life not here but elsewhere. So, whatever you earn you have to send it home. Because if something unfortunate happens to you, you will still have something back home. You know what it is to travel from one tram to another tram in different directions? Well, this is what I did one day, I didn't want to go back straight to my place. They know your routines, because they have been following you for a while. It is tough! I even changed all the days with my employers, I had to scramble my whole working schedule. Another friend of mine, also a domestic worker, went back home because she could not bear this constant risk. And she had a reason to be afraid of getting arrested. Because the police who caught other colleagues of ours had pictures of these people. The police knew where everyone was living and they knew all the houses where they were working. The police even had photos of them opening the door to their employers' house. So, someone was following these domestic workers for a while. This case was really a surprise, because nobody knew these colleagues were under surveillance for so many months. And yes, after that, we were all very paranoid. These are people I really hate to meet in a train or in a tram, because they can arrest me. I heard a story of some friends that were on a train. There were policemen on the train, suspicious and looking at them. Maybe because of their Asian look, I don’t know. But they were asked to present their ID and so they were caught. Therefore to avoid this kind of situation, we go away discretely when we see a policeman. If this happens, we say to each other: “There is friendship!” But in a way this creates the idea in your own head that you're a criminal. The word criminal stays with you because of all the stories from others, it gets into your mind. I don’t allow any person or a card to define me. Because I believe there's more I can do than being undocumented. Some of our undocumented colleagues are very intelligent and very dedicated. But they allow their situation to limit themselves. I keep saying: “Hey, you shouldn't let a card define who you are, or limit where you want to go to. There are so many things to do here for everybody!” Yes, we are limited in a way, you cannot do whatever you want if you're undocumented. But there are many other things you can do. So, while you're waiting what your future is going to be, why not just take a risk and explore? This is actually what I am doing. Sometimes I travel abroad, without fear. Some feel more secure now, because they know that I am legal. So leaving the house in case the police come is no longer an issue. They aren't afraid that I will be caught by the police, they know I can defend myself one way or the other. I don't have to run away anymore, I will come back to them. So, the clients I work for don't have to worry about that anymore.